Diplomacy to get the Soviets to remove the missiles. Warn Castro and scare him enough to remove the missiles. Blockade any Soviet attempts to bring more missiles to Cuba. Air strike on missile sites by the US Air Force. Full scale invasion of Cuba. After serious consideration of all options, the U.S. went with option 4 – Blockade. Krushchev famously stood down and removed the missiles from Cuba, and we all went back to our happy little Cold War. Like the Americans in ’62, we had indications that something was brewing with the enemy for a little bit now, but we didn’t get confirmation until today. Ari’s pulmonary valve has failed. We’ve reviewed the photographs. It’s toast. Attention all Colonial units. Cylon attack underway. Do nothing: Ain’t gonna happen. Diplomacy and warnings: No minor changes will help. The time for outpatient treatment is over. We’ve been admitted here at Children’s. Blockade: We send a clear signal of our military might by starting in with serious medications to “buff up” Ari’s heart, and get the problems created by the failed pulmonary valve to back off. Air strike and full scale invasion. The joint chiefs in ’62 were unanimous that this was the best option. It might seem on its face that if the valve’s failed this is the first stop. Perhaps not just yet. Stay tuned. As you might have guessed, we’re going with blockade. We are now back living at the hospital so we can treat the problems with all due speed and options just shy of all out war. Worsening heart function, especially in Ari’s right ventricle. We’re starting digoxin to help his heart squeeze and lower his heart rate, and starting Enalapril (which, by the way, our dog Toby takes for his heart condition…coulda just grabbed some from the kitchen) to lower his blood pressure and reduce the workload his heart has to bear. If these work, his heart function should improve quickly. That will help slow his breathing and, we hope, allow for weight gain. While the enemy will still be there, he’ll effectively be back down until he regroups. Ari needs a new pulmonary valve – this is a given – it’s just a question of when. The enemy could stay down for a while. Some kids can live with faulty pulmonary valves for years. Others can’t. With Ari’s other challenges, we just don’t know. When we were talking to the cardiologists today, they said they’re hopeful that the medications will work and we can kick the surgery can down the field for a while. He needs to be 3 or 4 or so years old before he can get a decent replacement. Until then there are no good options. You might remember that this pulmonary valve is a homograft, or cadaver valve, which we put in because it was the only valve available in his size when he had his Ross procedure. The valve lasted about 4 months. Failures every 4 months would be bad. If we can back the enemy down temporarily, we’ll know sometime in the next week or so. If we can’t, we yield to the joint chiefs and go full scale assault with a new valve. This would mean open heart surgery. Here’s hoping Krushchev is feeling reasonable these days. At least enough that he goes back to his trench, we go back to ours, and we just aim at each other but no one shoots for a while. Further updates, as we get them. Ari, you have many weapons, amongst them: positive outlook in life and lots of love. I have all the confidence in you. A local priest once said to me that: “You will later in your life learn that the hardest years in your life were also, without the doubt, the best ones”. However, Ari, don’t get me wrong with this anecdote… While I understand that you are giving your parents the best rollercoaster ride ever and keep them working really hard, I would love if you to gave them a bit of breathing time, too, by staying healthy and out from the hospital. I send you lots of strenght and wait for the good news. My heart sunk at this news-I’m so sorry , and hope that the meds work for Ari. You’re all in my thoughts and prayers. Prayers to you=beautiful =Ari and sending hugs to comfort your family. Dammit dammit dammit. I just had the chance to read the Hotel Stowcation review with its glorious picture of the Flying Ari – and now this. I rate this development all big, heavy stinkin’ diapers. Your writing, even in the face of this, continues to amaze, inform and inspire those of us who cannot begin to fathom how you all manage to put one foot in front of the other day after day. Here’s hoping you can stand down and that the blockade plan works for a good long time. So sorry to hear Ari is back in the hospital, I’m praying for him to get better soon, hugs and kisses to you all! Prayers coming from NC,.. Thanks for all the updates.. I hope to meet my little cousin some day soon.. Apparently Ari was not receiving enough attention at home. He needed the 24-7 multi-person tag team that he gets at the hospital. I am so sorry you are all in for another round of hospital living. As always you are in my thoughts and prayers. We send all our love and prayers for health. Ari, you are all that is good and right in this world, and we have faith that you will demolish this obstacle, like you have all the others thus far. Stay strong, little buddy. Ari you give me strength every time I see your smiling face. So I am giving it back to you double time. I got to see you thru the Fb of your beautiful Auntie Wendy and your daddy. You have so much to give us and we have learned so much from you at such a young age buddy so you keep on fighting and so will we thru prayer,friendship and hope. Sending you one big giant hug to you and your family kiddo. With all my heart I pray for you to be well. You are without a doubt giving your heart to this world, so I want you to have my strength and know this Ari you have touched the hearts of everyone who has ever see you smile. Be well my dear friend. One day I hope to meet you and collect my hug. UGH I really hate to hear this news. All my love and prayers go out to you. Fellow heart grand-mimi here, sending prayers and good thoughts to you all. Ari, my love, you look so good……….have faith, and to Mike and Ericka stay strong. I know that cardiology team at CHMC and they ROCK! They will figure it out. Ari, I still haven’t met you….but I want to and I will!!! Love you little buddy! 😦 Sorry you are back at the hospital again. We are thinking of you and sending hugs and positive vibes your way!! Molly’s friend and fellow heart mom from Kansas….thinking of you guys and knowing how it is to live at Childrens. We’re behind you and your parents all the way Ari. Lots of prayers and good thoughts. This little set back won’t keep “Danger” down for long. Such a little fighter you are but with mom & dad along with family & friends fighting with you, you’ll be back at home soon. My prayers & love go out to all of you. on October 11, 2012 at 7:58 am | Reply Lin G.
Strength prayers going out for all of you. Keep up the fight, little man. 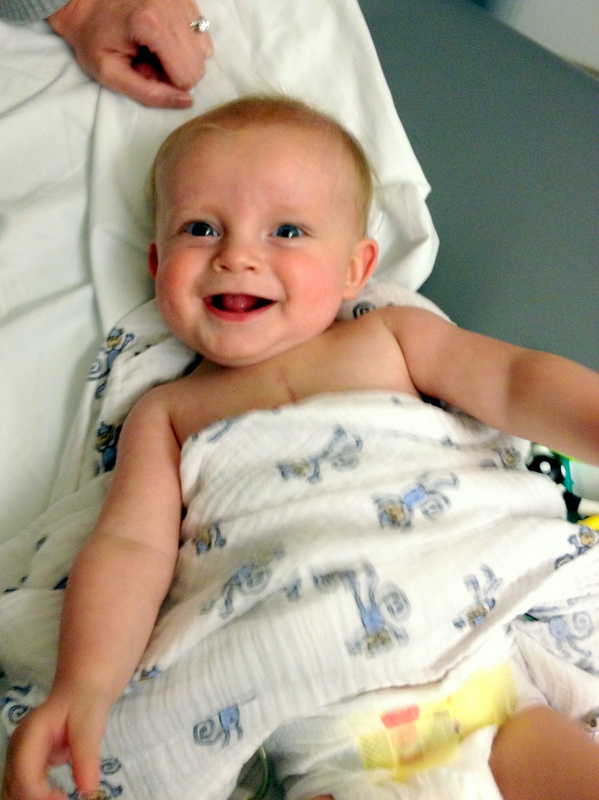 Hang in there Ari…you’re a strong little man with amazing parents!! Thinking of all of you….hang in there cutie pie!! We’re right here with all of you…. Oh i am praying. I am so sorry! Ari, MIke and Erica – Our hearts go out to you. We know that life seemed to finally be settling in for all of you before this most recent bout. Ari has been looking so healthy. We hope and pray that Ari’s heart realizes that there is much to live and be healthy for and in time “rights itself” so you can all enjoy a beautiful loving life together! Ari, we are rooting for you! You are an amazingly strong little guy. Praying for you and sending you and your parents strength. Oh Ari…I’m so sad that you are back in the hospital. Home is where you belong. By the pictures we can tell you love it there. Well Ari it’s time to stare down the enemy again. We are doing it right with you. We are praying for your family’s strength. We love you and anxiously await your updates. Sleep well sweet boy! Thinking and praying for all of you tonight. Ari’s smile brightens so many people’s day – hang in there little man – you have an army of friends praying for you and your family. It’s great seeing your sense of humor in spite of another setback. Sending prayers that the medication approach works and his function improves. I hope you and the Mrs are hanging in there! We’re still with you little buddy. Kick that ball into the end zone brother!!! We love ya from way down in here in South Carolina!!! YOu are in my prayers to tonight. Ari rest well knowing that your parents and the Doctors along with all the all medical staff will do all they can do for you. You are such a blessing. Lots of hugs and kisses for you and your parents to know that You are a Well Loved Child by Many. So sorry to hear this you guys. Here’s to hoping with all my might that they can get this problem to back off. Best wishes to you Ari, stand tall in the face of this obstacle like you have so many others. Hey you guys, I cannot believe y’all are back in the hospital….Your little guy looks sooo good….Hugs, love and lots of prayers that the new drugs will settle things back down…. Praying that the enemy backs waaaay down. Praying for strength for you and Erica. I met your dad in front of Harvard Medical school last spring, walking one of your furry friends. I was busy playing games and relaxing to forget about the demands of medical school for a moment. In speaking to your dad and hearing your story, I was reminded of WHO i’ve come to medical school for. It is to make sure people like you get every chance to keep smiling, to keep enjoying their wonderful family and friends, and to live life to the fullest. Your smiling face just brightens my world, even though I have not met you. You continue to fight so well… i am cheering you on. Thank you for inspiring me with your story. I will be praying for you and waiting for good news.